A Vietnam War serio-comedy, Air America is a lightweight and episodic film about civilian pilots engaged in illicit CIA flights over Laos. It's the late 1960s, and despite official protestations from President Nixon that there is no meaningful US involvement in Laos, on the ground there is a full scale secret CIA operation to drop supplies to friendly forces willing to fight the Vietcong. To maintain the cloak of deniability, a motley crew of civilian pilots are recruited and employed by the fictitious Air America. Charismatic Gene Ryack (Mel Gibson) is one of the pilots, and he is operating a gun-running side business for personal profit. Young pilot Billy Covington (Robert Downey, Jr.) soon joins him, after encountering licensing problems by flying his traffic helicopter too low over the LA freeways. The Air America flights are also being used by corrupt local military commander General Soong (Burt Kwouk) for drug trafficking, the CIA in effect facilitating the illegal trade in narcotics. As Covington starts to realize the scale of the operation, the danger posed by anti-aircraft fire from undefined "unfriendlies", and the carefree, fatalistic attitude of the pilots, things are complicated by the arrival of a US Senator (Lane Smith) on a fact-finding mission. Meanwhile, a refugee camp run by Corinne Landreaux (Nancy Travis) is located next to an opium-producing poppy plant field, placing a large group of civilians in danger. 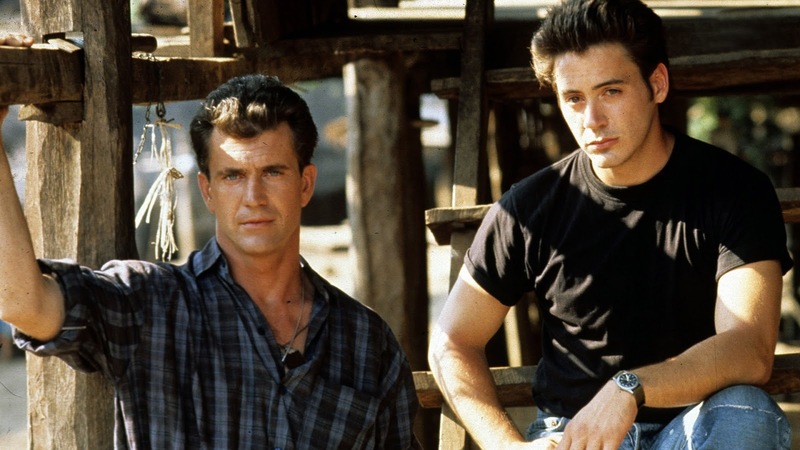 Air America is an underwritten, largely inconsequential film, leaning heavily on Gibson and Downey Jr. for star power, plus a soundtrack of late 1960s music. With no real plot, it is doubtful whether director Roger Spottiswoode ever really knew what kind of film he was making, other than holding on to some vague notion that it may be a good idea to meld the cynical comedy of Good Morning, Vietnam with the counter-culture irreverence of MASH. 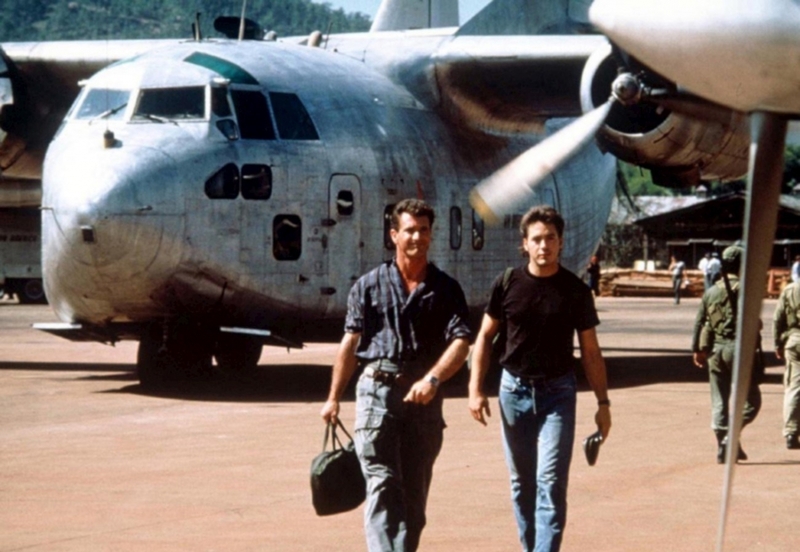 The result in Air America is a sputtering film punctuated by visual highlights that barely connect to each other. Downey is dangled from a helicopter for a long ride that is maybe supposed to be hilarious, and Gibson and Downey are trapped in a helicopter that in turn is trapped high up in a tree, nose-down. They unbuckle their seat belts for a stunt-man descent that is maybe supposed to be thrilling. These are the sort of scenes that work well in a 90 second trailer, but in the context of a film searching for a purpose, they are obvious crowd pleasers papering over the almost total absence of substance. The one scene that does work well has Covington crash landing a stricken large transport plane on a dusty airfield. Spottiswoode prolongs the inelegant crash into an endless, sardonic sequence, the plane lumbering to a slow halt thanks to lazy friction and countless obstacles that get in the way but never with any finality. A really late, desperate attempt to create a moral dilemma for Ryack, with his guns and Corinne's refugees vying for attention, smacks of a tacked-on drama that lands with a dull thud. Irrelevant and largely forgettable despite the star charisma, Air America falls many lengths short of a useful runway. Labels: Film Review, Mel Gibson, Movie Review, Robert Downey Jr.